Thank you for your interest in working at Full Harvest Farm, LLC. Here is some information about our farm and what we’re looking for in a Field Worker. Full Harvest Farm, LLC is an organic vegetable farm located just north of Hartford, WI in Washington County. We bought our 40-acre square in 2002, started growing and were certified as organic that same year. We market our vegetables primarily thru a 100-member CSA, at the Saturday West Bend Farmer’s Market and to several wholesale customers that include Outpost Natural Foods and Good Harvest Market. Our Field Workers are a vital part of our farm. We value people who are curious, hard-working, dependable, enjoy being part of a team and like to learn new things. It’s important to have your own car so you have reliable transportation to and from the farm. Folks who can make a seasonal, full-time commitment, in other words, work from May/June until Thanksgiving of this year, will have a significantly improved chance of being hired in the spring. That said, we do hire summer-only, part time and short-season Field Workers. 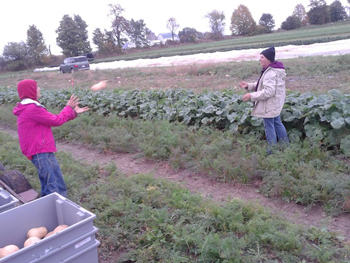 We usually start with 1 Field Worker in early spring, then increase to 2-3 Field Workers from June until Thanksgiving. Depending on how much produce is in our cooler, we might need 1 person into December. Our Field Workers learn a wide variety of jobs. These include seeding, transplanting, cultivating, harvesting, washing, packing, hoeing, watering, laying drip tape, row cover and mulch, cutting grass, pulling weeds, etc., etc. Whatever needs to be done on the farm, Chuck, Terry and our field crew are responsible to do it. You don’t need to be a star athlete, but you should be reasonably fit physically. We encourage you to ask questions, make suggestions and work independently. Our crew works Monday thru Friday, generally 8am to 4:30pm, with a half-hour lunch. We are out in all kinds of weather: hot, cold, wet or dry. Whatever the conditions, the work must be done. The hourly pay is based on experience. 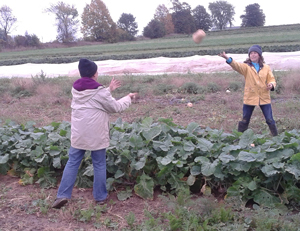 Our introductory wage is $9.00/hour for someone with no farm experience, but willing to learn and work hard. After we’ve worked with someone for a few weeks, we usually increase their wage. Full Harvest Farm, LLC will pay up to $12/hour for people with experience and useful skills. Employees who stay for the entire season receive a pay raise in September. Employees who return for the next season also receive a pay raise. If you have skills in repairing equipment or driving a tractor, those are especially valuable, and we will pay more to someone with them. If you’re interested in learning to drive a tractor, or accept the responsibility of a delivery route, we will teach you and pay you more for these duties. We provide our employees with tools, instruction in vegetable production and organic agriculture, meaningful work, lots of fresh air and the chance to work with a team that makes a real contribution towards feeding hundreds of people. A wide variety of free, organic vegetables is part of the package. If you are interested in applying for one of our Field Worker positions, please download our job application, fill it out, and email it back to us as an attachment to: fullharvestfarm@yahoo.com. Include a short introductory message telling us a bit about you and why you want to work at Full Harvest Farm. We’ll read it over and get back to you shortly. Download a copy of our employment application today!